We want to thank all who joined us in July for our BBQ/food challenge! The entries were so gorgeous and inspiring! As promised we have 2 winner this month...each winning a super cute KennyK Whimsy Stamp. Please email lora at onecrazystamper dot com to claim your prize. Put JULY CHALLENGE WINNER in the subject. Be sure to check back tomorrow for another fabulous challenge! Happy Monday! 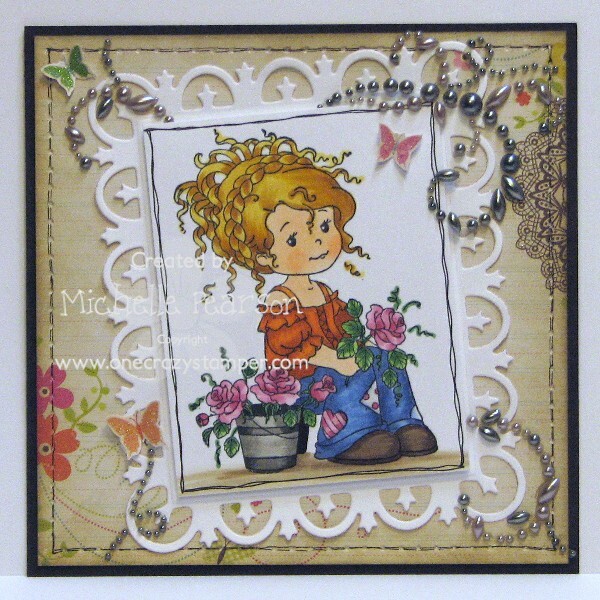 I have a card for you using the Wee Florist image by Whimsy Stamps. These little ladies are so adorable and fun to color! 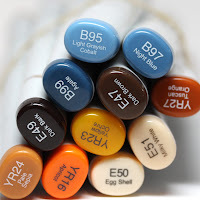 I colored my image with the following Copic Markers: E49, E47, E44, E43, E42, W7, W5, W32, W1, G46, G43, B45, B41, E02, E00, R85, R83, R81, E35, YR27, YR24, YR15, Y21. 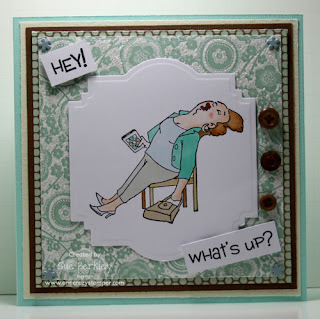 I doodled around her and layered her over a Spellbinders Fleur De Lis Rectangle die. Papers I used were from Simple Stories' Fabulous collection. I embellished my card with some Prima pearls and some glittered butterflies. Lots and lots of new goodies being add to the store daily....have you looked today?! 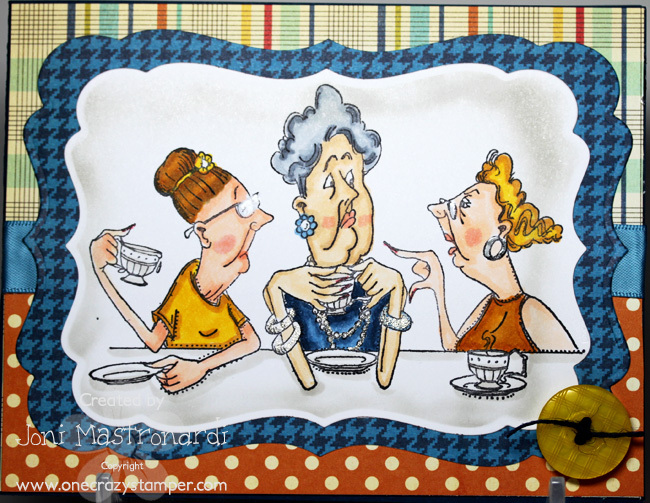 I have used the stamp called Power Napper from Art Impressions for my last post of the month. It is certainly how I have felt this week after being on vacation and then returning to work, and doing catch up non stop. The sentiment is from an old Hero Arts Set. There are still a couple of days to enter this month's BBQ / Food challenge for a chance to win a prize from One Crazy Stamper. Since Wednesday, will bring a new fun challenge check Lora's store One Crazy Stamper for new products. I have a FUN and EASY tutorial for you today! I love this adorable High Hopes image called Flame Broilen. 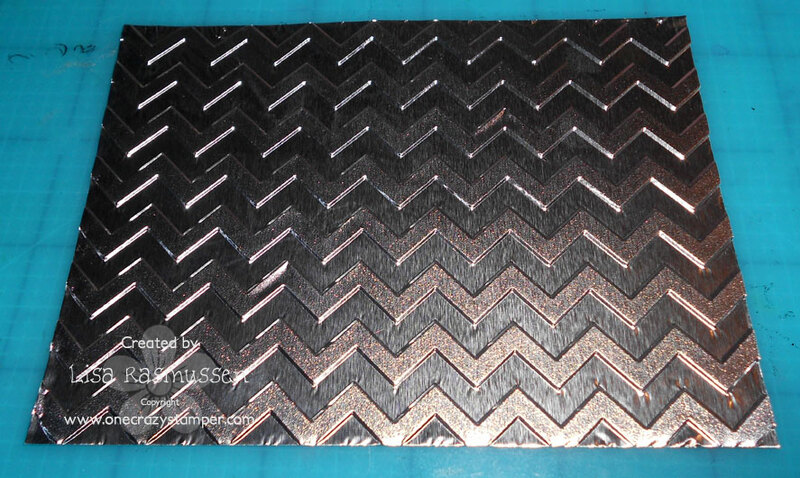 I knew as soon as I saw this image I wanted to use foil. As in aluminum foil for cooking! I figured since it is so flexible it would probably hold a shape! I started by stamping my image as I usually do. 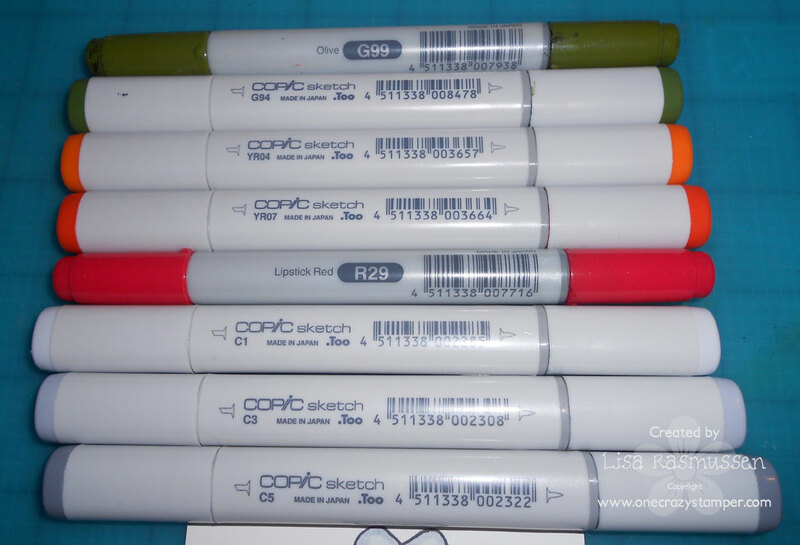 If I am coloring with copics I ALWAYS use Memento Black. Never, ever, ever smears! Here is my image colored. I have used foil before and I like to use heavy duty because the shape stays better. 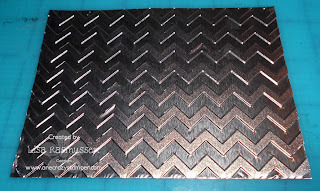 I usually just rip a sheet off then I place in my embossing folder (you can use ANY embossing folder-I have not tried an impression plate so since that is a lighter impression I am not sure how that will work). Once it is embossed I gently trim the edges in my table top trimmer. DO NOT push down very hard because you can flatten the shape right out! I don't use my tape runner on the foil but I do use glue dots on the paper I am attaching it too. I also used a brad this time to keep my place. I used some of the cool new brads that the store carries! They look like screws! Once everything is attached I completed the rest of my card! Isn't this a cool effect and super awesome for the men! A very cheap way to make your own patterned paper too cause a 50 foot roll was only a few dollars! I hope you enjoyed and I can not wait to see what everyone makes! If you use this tutorial definitely link in the comments I would love to see what you have done! 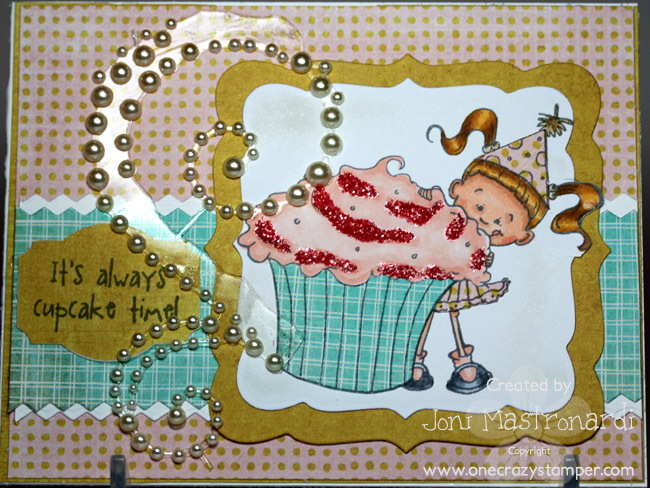 There is still time to join in the challenge at One Crazy Stamper. our theme... "BBQ or Food". 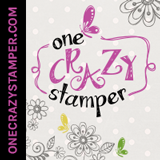 2 lucky participants will win a Whimsy Stamp from the One Crazy Stamper store!! Wanna see which Whimsy Stamps?! For my card today I have a new Kraftin Kimmie stamp Lulu's Birthday. I stamped the image with Memento Tuxedo Black ink unto Xpress It card stock. I paper pieced part of the image with Basic Grey Paper Cottage. I also used the copics below to color the image. I added some Ranger Spun Sugar stickles to the cupcake. I added some pearl bling and there you have it! All items available at One Crazy Stamper. 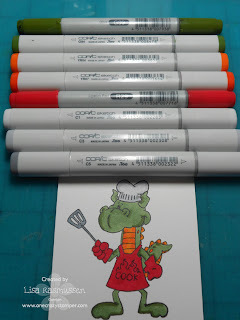 I colored with Copic Sketch Markers, Fern is by Memory Box Dies. Hi all, Madge here for another Wonderful Wednesday at OCS. I have really stepped out of my “monochromatic Madge” box for this card. Don’t you just love this image!!?? It is available at OCS and is called Chloe from the Elizabeth Bell Collection of Whimsy Stamps. I have to admit, this is really out of the box for me with the bright pink and lime green. When I looked at the little bee at the right, I know I should have added some stitching around the image – but too late. Materials used: Memento tuxedo black ink; Copic Markers; Xpress It blend cardstock; Bo Bunny DP; Flowers; EK Success and MS border punches; Cardstock from stash. “Stamp up a Storm, ink up a wish and send it on to brighten someone’s day”. Great minds think alike, or at least choose the same stamp to feature at One Crazy Stamper. Madge, a fellow dt member, featured this cute image a couple of weeks ago, and now here's my version of the same image. This is Whimsy Stamps artist Crissy Armstrong's "Good Pony" image, which I have colored with Copics. The pony's eye and the red apple both received a coat of Diamond Glaze, and then I cut the image out with Spellbinders Label 25. 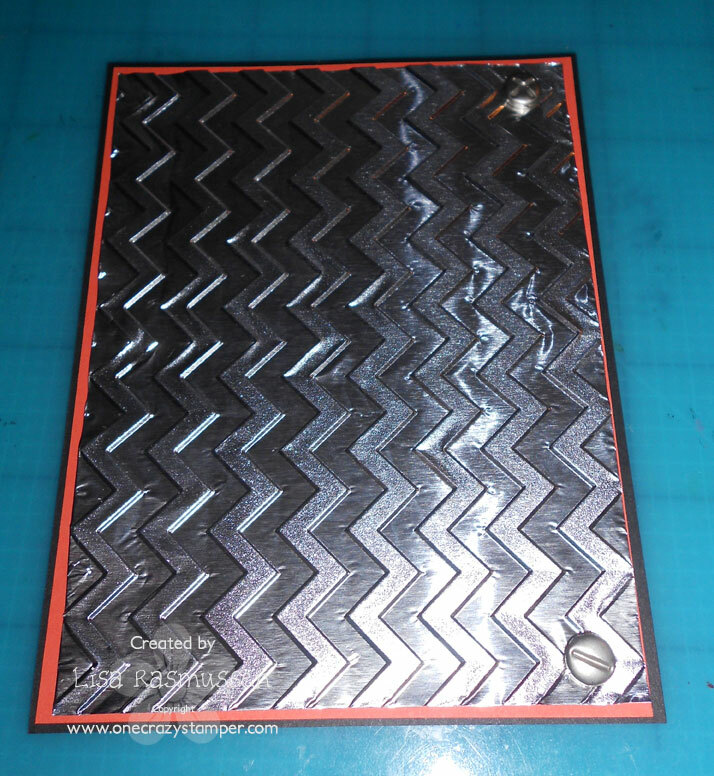 After cutting the image out, I noticed that the shape resembles that of a belt buckle, so for the mat I inked up a Cuttlebug embossing folder with black, and used the folder like a letterpress. 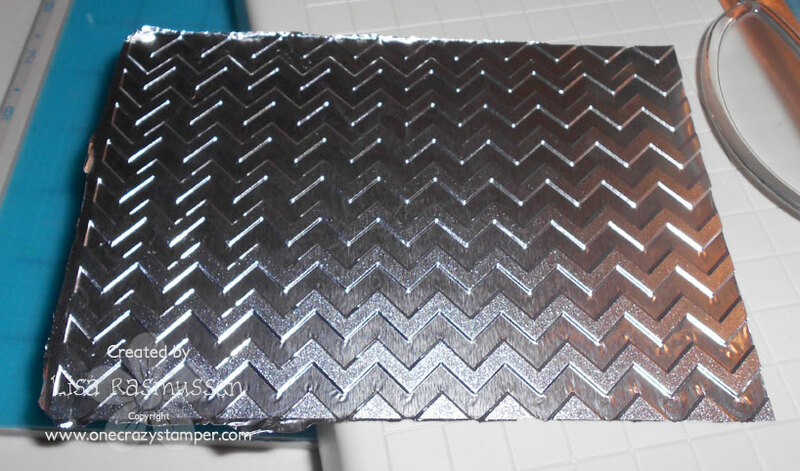 After embossing, I ran a Tsukineko Silver Metallic ink pad over the raised parts of the mat, creating the look of a metal belt buckle. The brown cardstock behind the buckle represents the belt itself. 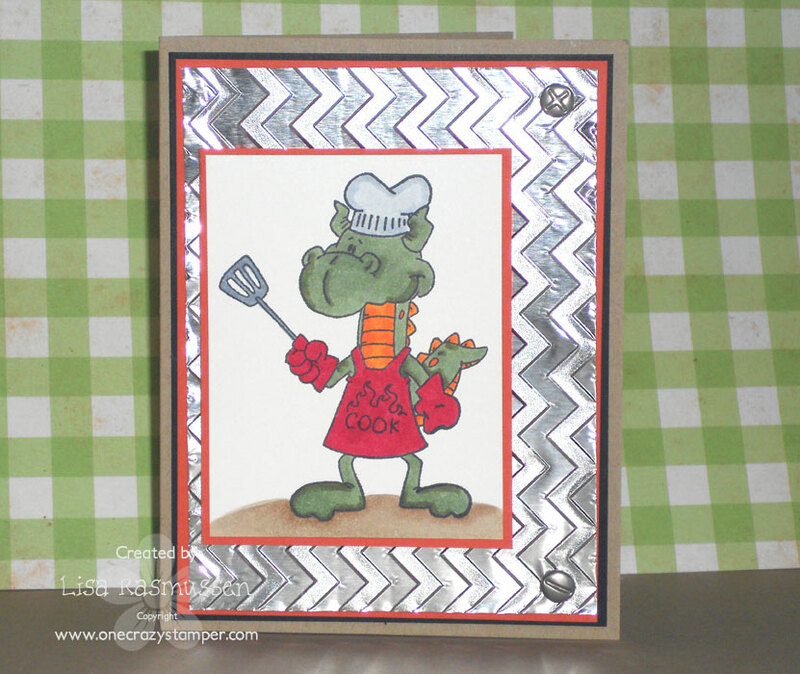 You still have a few days left to enter to win the One Crazy Stamper challenge blog with the theme of BBQ/Food. Happy Monday.....my week is off to a slow start here....but I had much fun creating this fun card for you today! 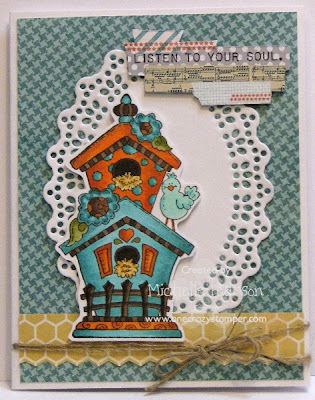 This image is from High Hopes Rubber Stamps and is called Fancy Birdhouse 1. I looked, and YES! there IS a Fancy Birdhouse 2! 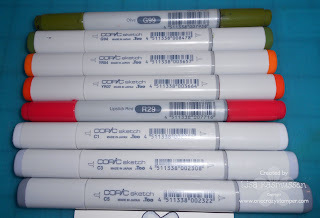 I colored my images with the following Copic Markers: BG57, BG53, E49, E47, E44, BG15, BG10, YG95, YG93, YR27, YR15, YR23, Y32. Papers are from My Mind's Eye's Be Amazing collection. The die is from Marianne Designs and is called the Lacey Oval. It's another hot and humid Sunday here in Brampton, and for today's post I have used the Humming Along stamp set from Flourishes available at One Crazy Stamper. 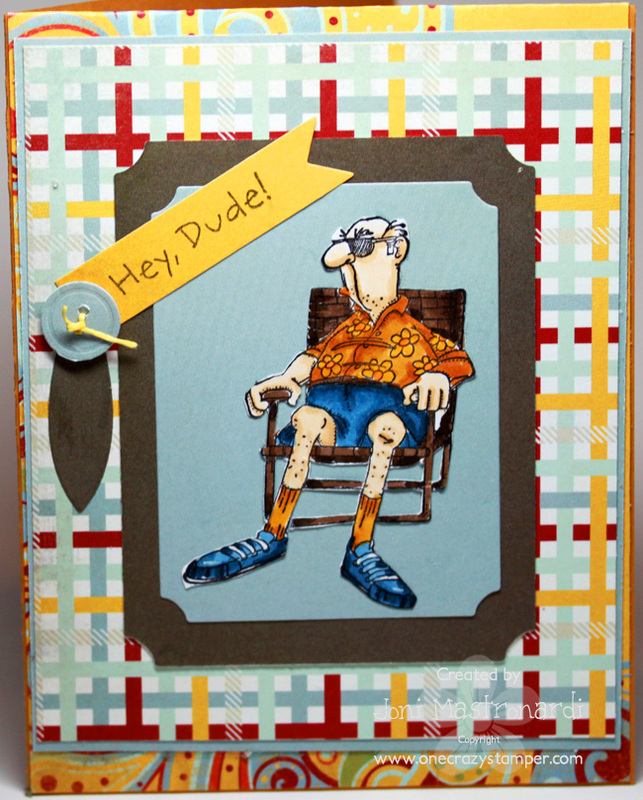 While you are working on your card for this month's challenge which is BBQ / Food, check out Lora's store One Crazy Stamper for some awesome products and deal. I don't know about you, but I have THE WORST time coming up with creative ideas for masculine/boy cards! I don't want to add too much because I am worried it might look girly! What does help is fun images that work well with masculine cards. 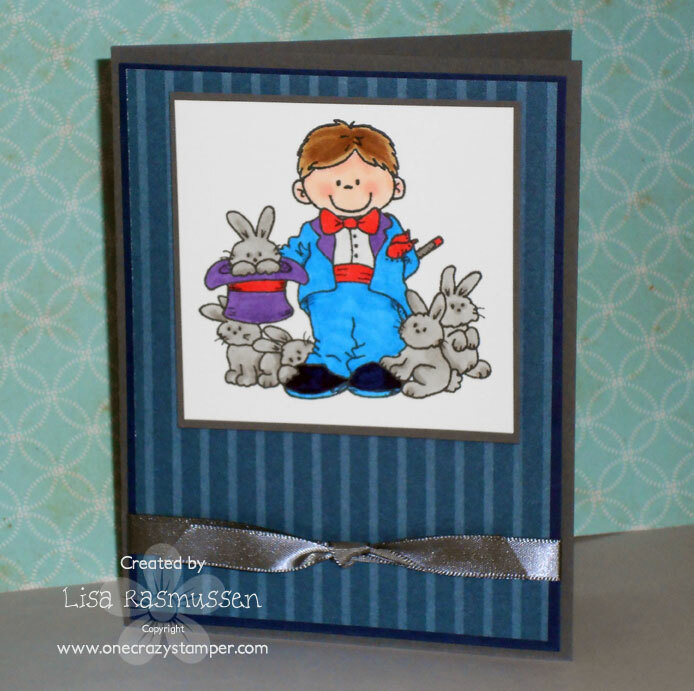 High Hopes has a bunch of great images that are perfect for boy cards! I used Henry the Great by High Hopes. I colored the image with copics and I always use memento tuxedo black. Hope you enjoyed the card and see you next week! 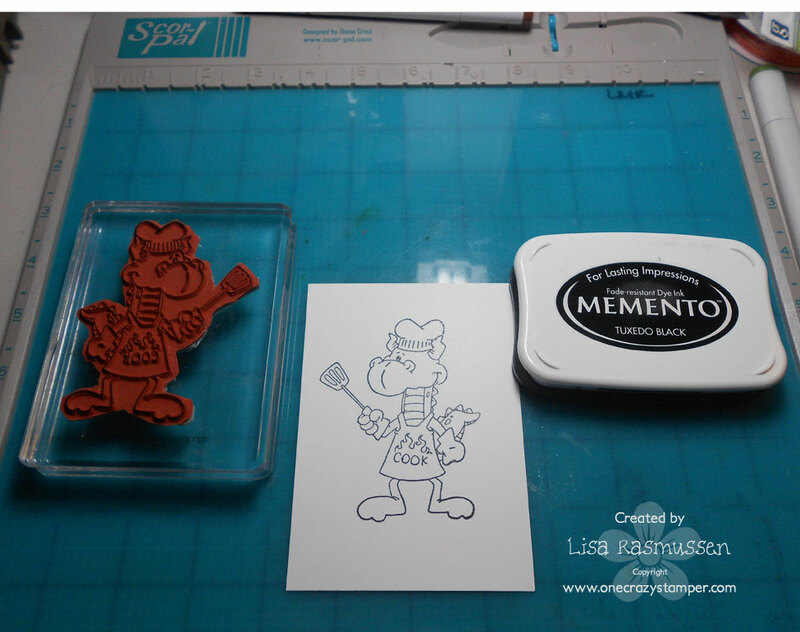 Today I have an Art Impression Stamp Norm available at One Crazy Stamper. I stamped Norm with Memento Tuxedo Black ink unto Xpress it card stock. I neatly trimmed the image and layered him on designer paper. Hi everyone Cindy here Welcome to my One Crazy Stamper project. I have used a Nellie Snellen stamp (Young rebels). Some Pearls and colored with Copic Sketch Markers. Terrific Tuesday is here again, the skies above are clear again, so let's sing a song of cheer again, Happy Days are here again!!! Thank goodness you can't hear my singing right now - it would probably scare you away if you could!! Summer is here and this sweet little girl has packed up her picnic basket with a bounty of her special Cinnamon Sugar cupcakes!! Wouldn't you love to join her? This is Whimsy Stamps Cinnamon Sugar from artist Elisabeth Bell, which I have colored with Copics. 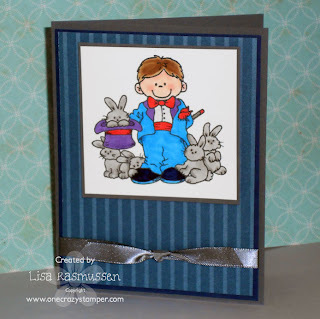 I have layered several sizes of Spellbinders Classic Scalloped Circles Small and the Grand Scalloped Circles to make this adorable easel card. 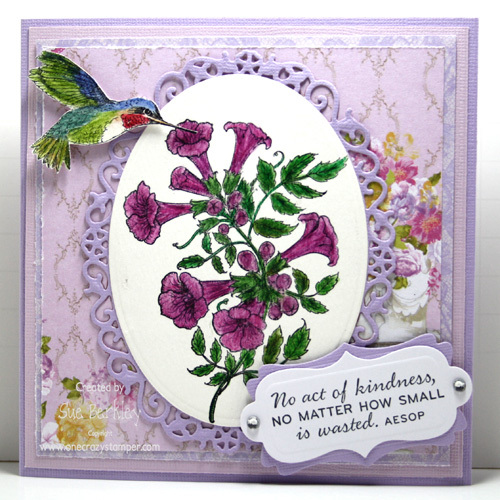 The dp is from the Hello Sunshine collection by Bo Bunny, and the flourishes are Memory Box's Elegant Scrollwork die. 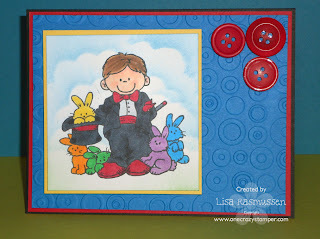 The center circle on the inside is also a Spellbinder die, and the felt flowers are from my stash. You still have lots of time to enter this month's challenge theme of BBQ/Food to win an awesome prize from One Crazy Stamper, so get crafting and enter!!! A simple title for a Clean And Simple card for One Crazy Stamper! My niece has a birthday coming right up....and this image is perfect! 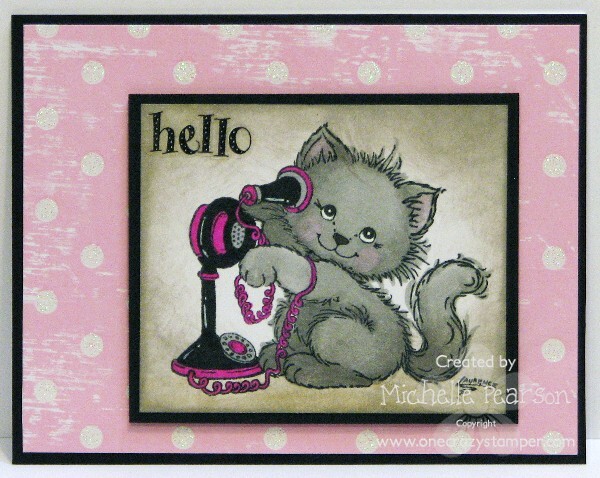 This adorable image called Hello by Stampavie inspired my pink, black, grey and white color scheme. 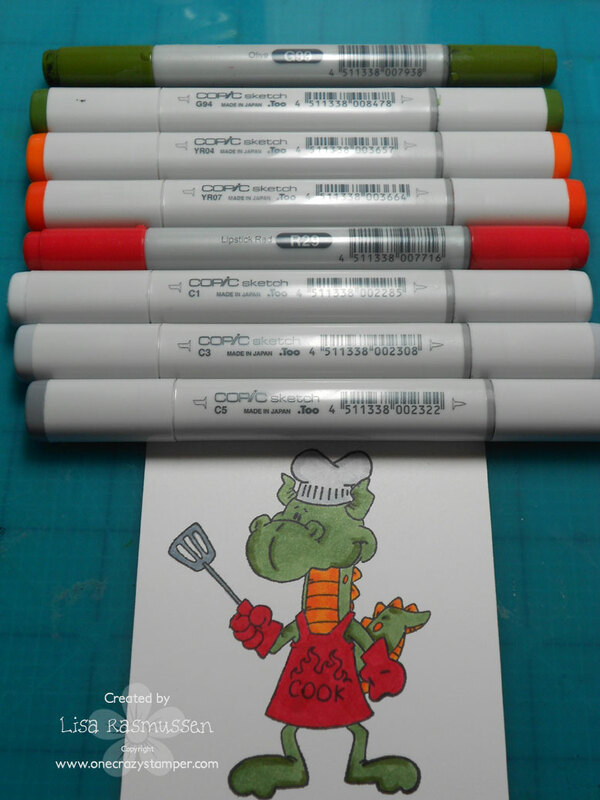 I colored my image with the following Copic Markers: 110, T4, T2, N3, RV10, E42. I used a pink Sharpie permanent marker for my phone details and used a Signo white gel pen to add the detailing on the phone back in after coloring it black. I also highlighted kitty's eyes with the white gel pen. Finally, I distressed the image with Tim Holtz Pumice Stone Distress Ink. I used a simple designer paper and some stickers to add my sentiment. Sometimes clean and simple just strikes me, and in this case I wanted the image to shine! 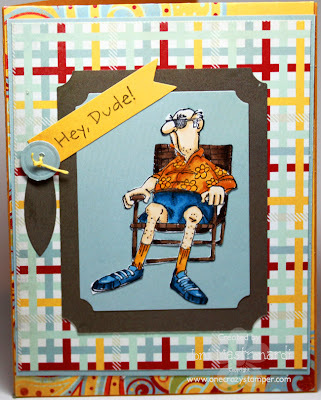 It's Sue here for my regular Sunday post for One Crazy Stamper. 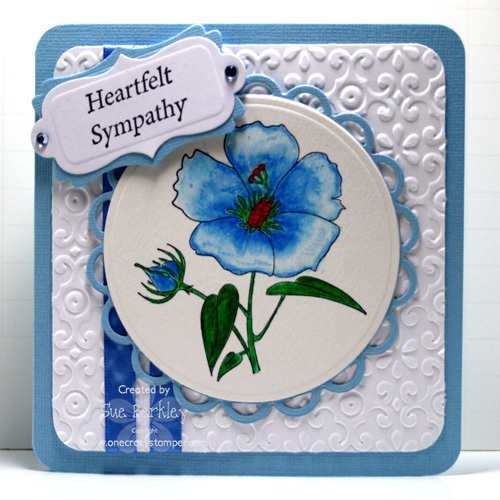 I don't know how others feel, but I find that a sympathy card is one of the hardest to make. This card will be mailed to a co-worker who just recently lost her husband. 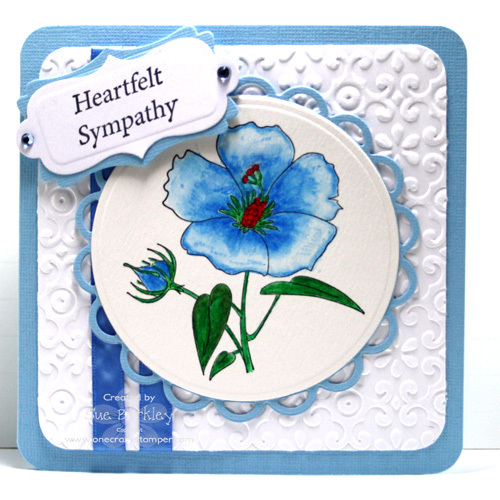 The image and sentiment are from a set called Sympathy Sentiments by Kraftin' Kimmie. The flower was coloured with the new Derwent Inktense Pencils. All supplies can be found at Lora's store One Crazy Stamper. There is still plenty of time to enter this month's BBQ/Food challenge for a chance to win a prize. See you next week for another regular Sunday post for OCS. For the last day and a half I have been looking for my USB cable for my camera....I needed the photos off of there, especially my card photos for today. I still can not find it but all of a sudden I realized I could insert my memory card into my laptop and download that way. Stressing for nothing :) OK so I think my card is perfect for this situation because I feel like I pulled the rabbit out of the hat getting my card posted! I used High Hopes Henry the Great! All I saw was bright bunnies when I saw this image! I find it hard to make boy cards because I don't make very many boy cards so I try to stick to primary colors. Also, for the black suit I used the C gray's so it is not too dark. 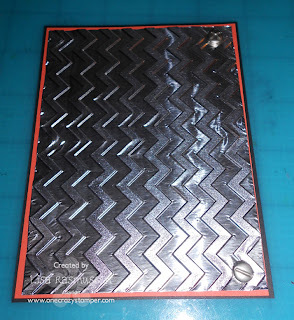 Next I used a Spellbinders Label 17 die to cut out and layer my focal image. DP is October Afternoon 9 to 5. Check out our blog and join in the fun for a chance to win! Hi everyone Cindy here Welcome to my One Crazy Stamper project. Today I used Dress Form Die and A Touch Of Elegance! !~ Fleur De Lis Doily Motifs and Buttons!! Quick post on another wonderful Wednesday at OCS . I’ve chosen a Whimsy Stamp called Good Pony from the Chrissy Armstrong collection. The challenge at OCS for the month of July is BBQ / food. I think this qualifies as there is an apple treat for the four legged friend. Can you believe I colored this image and then had to seek out paper to match – with no luck. I ended up making patterned paper with White Stazon. Check out the great selection of patterned paper at OCS. 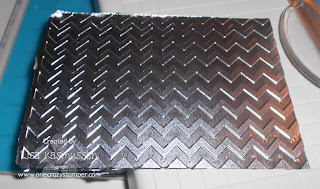 The stars were drawn and hand cut along with the black mats. The image was stamped onto Xpress it Blend cardstock with Memento Tuxedo Black ink, colored with copic markers and cut into a rectangle. I’ve been trying to use old (really old) products from my stash from 100 years ago…… do you remember “mesh?” I dug some out of my drawer and folded it around the bottom of my card, topping it with a knotted yellow gingham ribbon. I’ve noticed that there is only ONE entry for the free stamps from OCS!!! Hope to see your card there so I can visit your blog and say "hello”. Hope your Wednesday and the rest of the week are warm and sunny. “Remember, stamp up a storm, ink up a wish and send it on to someone to make their day”.